By mid-afternoon we finally weighed anchor and sailed out of the San Felipe Harbor on our 100-foot chartered boat, the Erik . We plotted a course for Puerto Refugio, about 150 miles south, which we wouldn't reach until the following morning. Of the Erik's crew of 12, none spoke English. 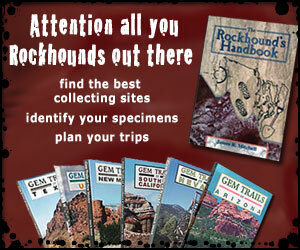 We would learn later that our group was a great source of amusement to them. The Erik was normally chartered as a sport fishing boat, and throughout our voyage, the Mexican crew members, being accustomed to rowdy, beer-drinking fishermen, mumbled in amazement that we should be so fascinated with visiting hot, barren, desert islands covered with bird poop. The small galley aboard the Erik was located forward on the main deck. It was run by the elder Spanish crew members and held only 8 people at a time. Normally, dinner was served at 5 PM for the first round, the second round ate about half-hour later, then the crew wandered in to eat last. Although I was prepared to survive on Power Bars and the fresh fruit I had brought along, an afternoon of strenuously watching the eastern Baja shore slide by piqued my appetite, and by 5 PM, I joined round 1 in the galley for a hearty portion of greasy tacos, beans and rice. During our first meeting that night on the middle deck where the outside bunks were located, zoologist Dr. Nancy Jessop, who was making her 20th field trip, explained our general itinerary and the schedule for the following day. Trip organizer and ecologist Jim Gilardi discussed the journals we were all required to keep and pointed out the various tools and resources that were loaded in cases on deck, including microscopes, plankton nets, a GPS device, an infrared thermometer, a CO2 measuring instrument and a large library of books about Gulf fauna, flora, geology and history. Jim then played a couple of videos about the Sea of Cortez and previous field trips -- a bit surreal sitting there on deck in the primitive Sea of Cortez watching video tapes. After the meeting broke up around 10 PM, I headed down to the cabin and talked with my young cabin mates before they went back on deck for a late-night party. This left me alone in the dark with the drone of the diesel engines while the Erik steamed southward through the night. We would run south all night from San Felipe and anchor before daylight at Puerto Refugio, a protected bay at the northern end of Isla Angel de la Guardia, about 29.5 degrees north latitude. I remembered Puerto Refugio from John Steinbeck's account of his expedition here almost half a century ago. The fact is, ever since I had read Steinbeck's The Log From the Sea of Cortez I've wanted to journey by boat to this area of the world. Steinbeck's log describes the 6-week expedition he took with his good pal Ed Ricketts in 1940. Ricketts, who owned a marine biology supply house in Monterey, California, was the model for Steinbeck's character Doc in Cannery Row and other novels. Their expedition together was undertaken to collect and record marine specimens which Ricketts sold to schools and universities. His textbook on West Coast marine biology is still used in college curricula. Steinbeck himself had studied marine biology at Stanford University before dropping out. Slightly before first light, I was awakened by the heavy, grating sound of the anchor chain running into the Gulf not too far from my head; we were dropping anchor at Puerto Refugio. I popped from my narrow bunk, climbed the stairs to the main deck, and showered by first light in one of the two cold showers aboard. I dressed in sandals, a tank top and amphibious shorts, then shivered my way to the galley where I greeted the cooks and helped myself to the coffee urn -- Folgers, fake Cremora and sugar in a Styrofoam cup, just like back in the U.S.
As I stood on the foredeck sipping coffee and watching day break silently against the glorious, steep cliffs of Isla Angel de la Guardia off the port bow, I noticed Comet Hale-Bopp beginning to fade from the northeastern sky. As daylight began to reveal more and more of the calm and glorious wonderland in which I rocked gently back and forth on the Gulf, I thought of Steinbeck's description of this part of the world. Others began arriving on deck, coffee in hand, to watch the sunrise, appreciate the seascape and await breakfast -- Allen, a computer programmer and longtime field trip devotee, his friend Sally, a Texas schoolteacher, Butch, an ex-marine from the Vietnam War era, Dan, a mechanical engineer and wildlife photography enthusiast, followed by bright-eyed young zoology students Don, Ellie, Kevin and Cheryl. Inside the galley, the two cooks were frying chorizo and scrambled eggs, grinning gleefully, smoking cigarettes and drinking coffee. The table was piled with bananas, boxes of breakfast cereal, milk, and giant jars of peanut butter and jelly. As with most mornings, we ate hungrily when breakfast was served at 6 AM, then made room for the second shift. 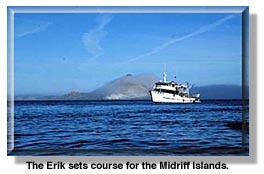 We would then pack our gear and prepare for our daily 7 AM departure from the Erik for tidepooling. 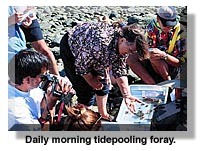 For the next 7 days, these tidepooling forays were much the same -- loading 5 of us in a ponga, scooting to an island shore, wading on the shoreline, overturning submerged rocks and collecting various specimens in small containers. After an hour or so, we consolidated our collections in large plastic trays where Dr. Jessop would sort and identify the variety of starfish, brittlefish, sponges, worms, and cucumbers, one by one explaining, quizzing and celebrating the various invertebrate life forms collected. By midmorning, we would jump back in the pongas to circumnavigate an island or stop for an inland hike and explore whatever this particular island might offer, from reptiles to bird nesting grounds, to bat habitats or reptile habitats. Back on the Erik each day for lunch usually involved sandwiches or tacos, chips, soda and coffee. By 1 PM, if the Erik was not on course to another location, we would be off in the pongas again to hike an arroyo, visit a turtle sanctuary, snorkel a bay, count Osprey nests or enjoy more island circumnavigation. Upon returning to the Erik at day's end, some members would shower before dinner, while others jotted in their journals, talked, read, lounged or napped. Dinner was always a delight of genuine, home-cooked Mexican cuisine with a different fare each evening, but always accompanied by tortillas, beans and rice. One evening the menu consisted of fresh fish that crew members had caught while awaiting our return to the Erik. On another, we ate fried chicken under the stars on the top deck. 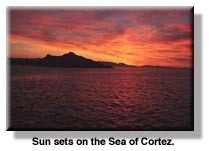 Sunsets were one of the major pleasures of our desert cruise, and as we gently rocked and watched daylight slowly drain from the Gulf each evening, Comet Hale-Bopp would appear in the northwestern sky. On our second night at sea, the full moon rose over the vermilion waters, only to be slowly extinguished by the last lunar eclipse of this century. The next seven days were filled with delightful explorations and activities as we hopped from one Midriff Island to another, working our way south, then slowly returning north along the Baja shore. On our first day, we rounded Granitos, went past Mejia to Sail Rock where we spotted a baby Blue Booby, then headed south to Window Rock on Angel Island. Here, we took an inland hike, identifying numerous plants and animals and grew intimate with the giant Cardon Cactus, which stand sentinel on all the Midriff Islands we would visit. We noticed many different plant species including ocotillo, buckthorn cholla, elephant trees, arroyo lupin, desert mallow, jimson weed and brittlebush, to name a few. On another day, after lunch while others hiked, 6 of us took two pongas to a cove for snorkeling among the sea lions, who darted past us at arm's length with their ever-curious wide eyes open underwater to examine us. With the Gulf at 58 degrees F, the sea lions' curiosity outlasted ours. The week passed quickly, filled with activities like unearthing bat nests on Partida, holding Chuckwallas and exploring open lava pools on San Esteban, counting Osprey nests on San Lorenzo, viewing phytoplankton through microscopes on the Erik's deck at night, measuring carbon dioxide levels on Smith Island, rescuing an injured gull on San Pedro, making a late-night bonfire on Salsipuedes and even climbing the steep and rugged 1,000-foot cinder cone of Coronado. 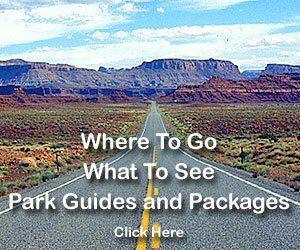 When we started the last long run back north to San Felipe Friday night, our "class" of 20 desert cruisers were already anxious for next spring to arrive so we could do it all over again. Many of us had learned more about desert and marine environments during the past week than we had learned in our entire lives. We also learned something about ourselves and about each other and about what a fine thing it can be to share such an grand desert experience with others.